H. B. Van Duzer Forest State Scenic Corridor is a 12-mile (19 km) scenic driving route along Route 18 in Lincoln, Tillamook, and Polk counties in the U.S. state of Oregon that passes through a forested corridor. The Van Duzer Corridor stretches from northwestern Polk County to Lincoln City, passing through the Northern Oregon Coast Range. The forest corridor was named for Henry B. Van Duzer, a member of the Oregon State Highway Commission and president of the Inman Poulson Logging Company, who was appointed by Governor I. L. Patterson as the first chairman of the Oregon State Parks Commission in 1929. 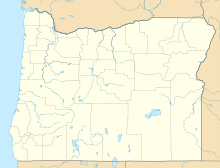 The land, purchased by the State of Oregon between 1935 and 1942, is managed by the Oregon Parks and Recreation Department, which also maintains a scenic rest stop on the route. An old growth Douglas-fir forest is located along the Salmon River. Roosevelt elk can be seen along the route. ^ "H B Van Duzer Forest State Scenic Corridor". Geographic Names Information System. United States Geological Survey. Retrieved June 26, 2011. ^ "Department of Transportation Records Guide: Agency History—1914–1939". Oregon State Archives. Retrieved February 10, 2012. ^ a b Bannan, Jan Gumprecht. Oregon State Parks: A Complete Recreation Guide. Mountaineers Books. ISBN 0-89886-794-0. Retrieved June 26, 2011. ^ a b "H. B. Van Duzer Forest State Scenic Corridor". 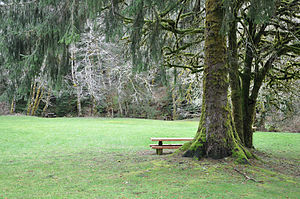 Oregon Parks and Recreation Department. Retrieved August 1, 2008. This page was last edited on 14 November 2018, at 00:14 (UTC).